It’s cold, eat more potatoes. Mix the cornstarch, vinegar, water, sherry, Braggs, and white pepper together until smooth. Heat the oil in large pot and saute the ginger, onion, and half of the mushrooms for 2 minutes. Add the stock, bring to the boil and add the remaining mushrooms, cayenne, carrot. Add tofu cubes, simmer gently for 30 minutes. Add broccoli and cook gently for 3 minutes, then slowly stir in the vinegar/cornstarch mixture until the soup thickens. Bring a small pot of water to a boil and cook noodles about 3 minutes, until al dente. 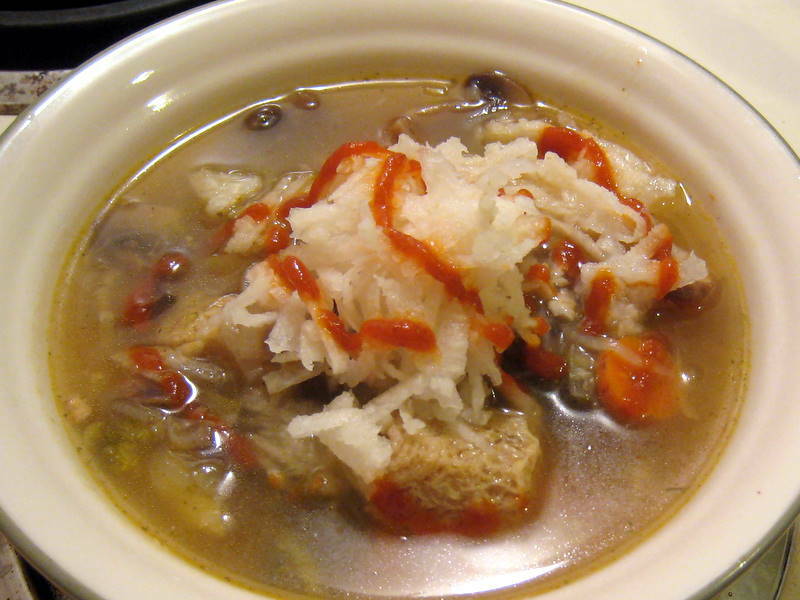 Serve soup with noodles, and top with jicama and siracha. Don’t worry, this is still a ginger post! We borrowed Isa’s new Mushroom Hot Pot recipe and this delicious Lettuce Wraps recipe from the Veggie Converter. 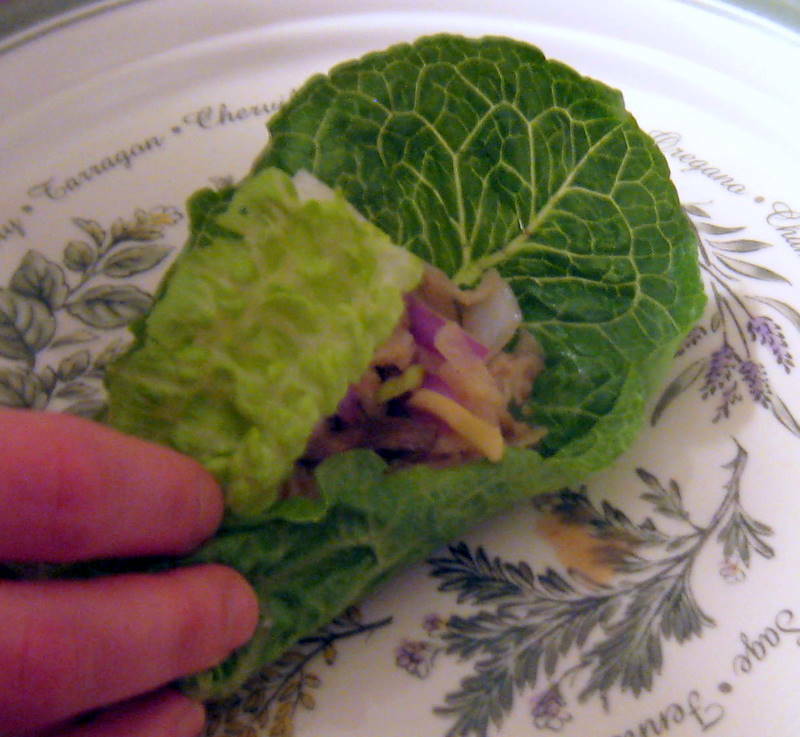 We followed the lettuce wrap instructions with minimal changes. We reduced the agave and soy sauce, and subbed tiny pan-fried tofu cubes instead of seitan. (Yes, actual size was cute x cute.) This was SO GOOD. 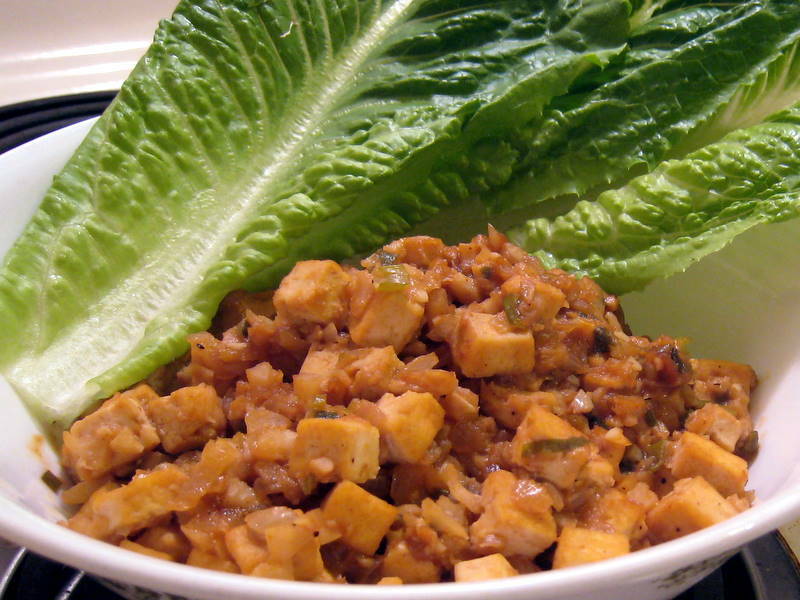 If you’re soy-free, try diced, pan-fried mushrooms, or maybe even jackfruit? The soup turned out really well, with lots of surprising flavors in every bite. 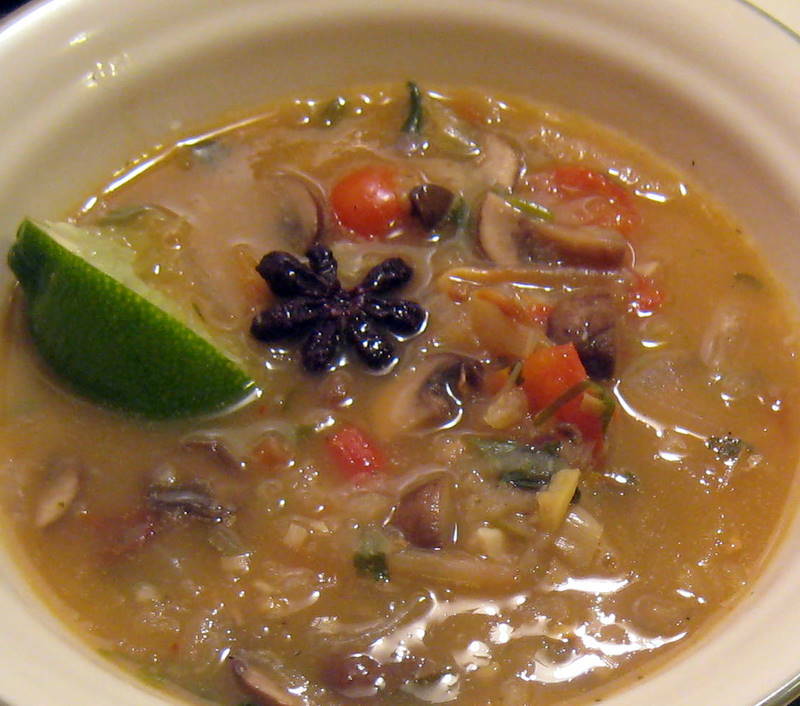 We used tons of cremini mushrooms and some veggie broth instead of the mushroom broth, and not as much coconut milk (full-fat) instead of the 1 can of reduced fat. We also ditched the bell pepper, added extra tomato, and extra red pepper flakes. For the mix-ins, we used what we had on hand: fresh cilantro, green onions, mung bean sprouts, and grated jicama. And of course, lots of extra lime juice in each bowl. The jicama gave the soup a similar mouthfeel to rice noodles, for an added heartiness! To make up for yesterday’s skimpy post, today is a twofer. Too bad we didn’t think of this ahead of time; it could have been Twofer Tuesday. Also, don’t worry, we will post the moussaka recipe soon! Preheat oven to 450 F. Blend together Earth Balance, water, lemon juice, miso, ginger, and garlic. Mix until fully combined with no big chunks of ginger or garlic. In a cake pan, toss together mushrooms, sauce mixture, and shallots. Bake for 20 minutes, stirring every 5 or so. Remove from oven when sauce is nice and thick. In a pan, saute Earth Balance, ginger, and jalapeno on medium heat for about 2 minutes. Add spices and lemon juice, cook another 2 minutes. Add peas, cook for 2 minutes or until heated through. Deglaze pan with water if needed. 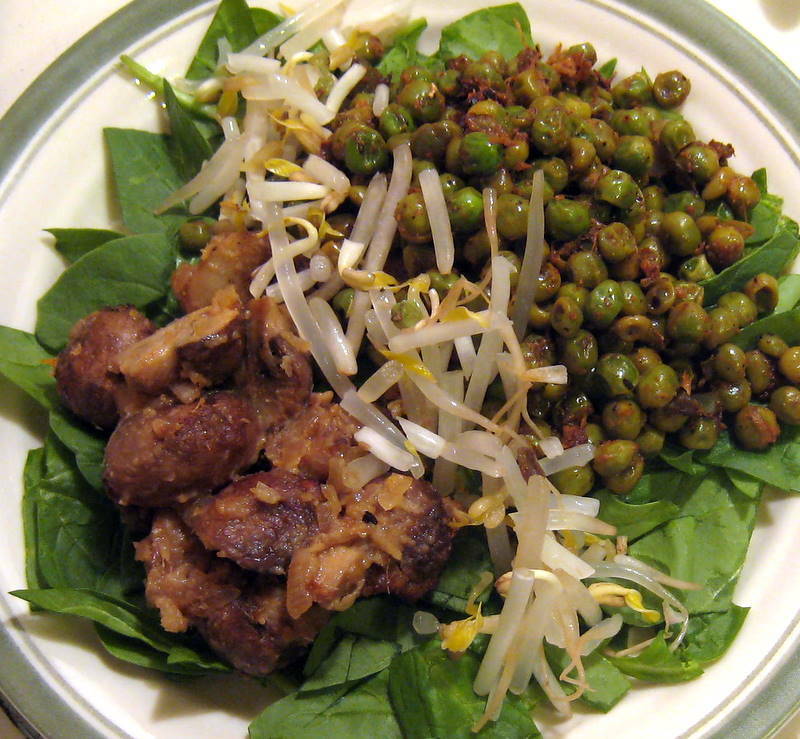 Serve with baby spinach and mung bean sprouts. Sometimes you need to eat salad with your hands. Contrary to the past week’s post, we eat actually eat a lot of uncooked foods. Salads, of course, and sometimes desserts, but also raw noodles, curries, and other tasty treats. One of our favorite recipe books is Ani’s Raw Food Asia: Easy East-West Fusion Recipes the Raw Food Way, which is full of terrific and accessible recipes for jazzing up raw foods. 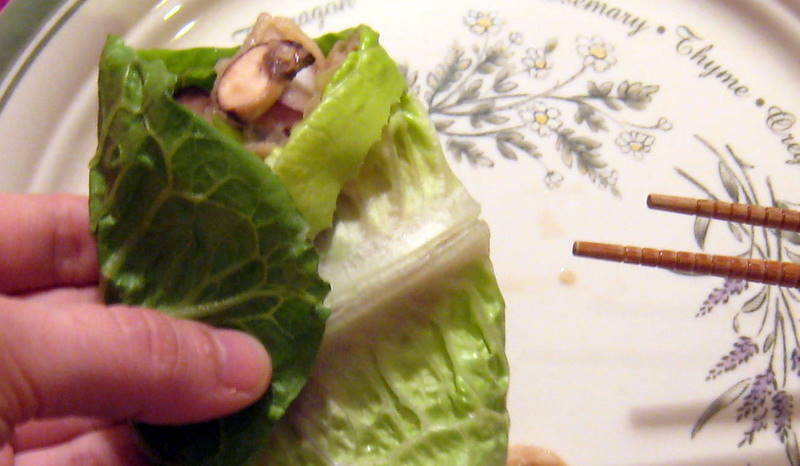 Though not completely raw (because of the peanut butter), this lettuce wrap is inspired by Ani! 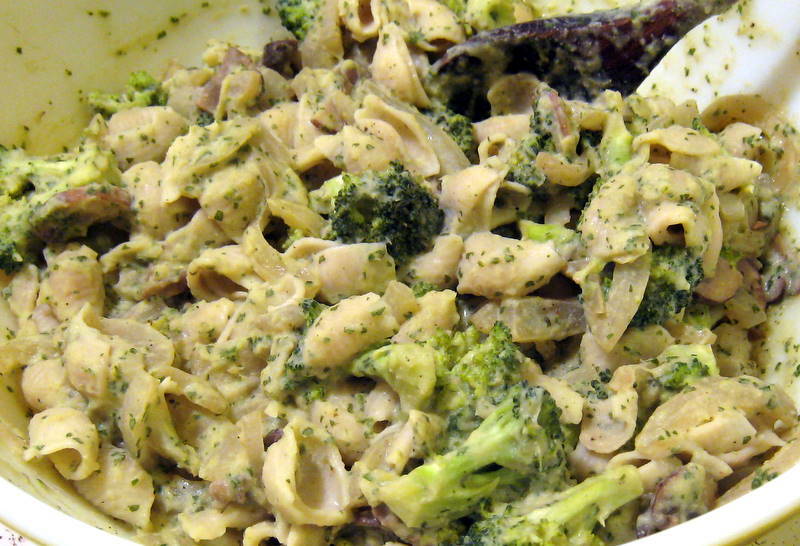 Combine lime juice, peanut butter, Bragg’s, and sesame oil and whisk well. 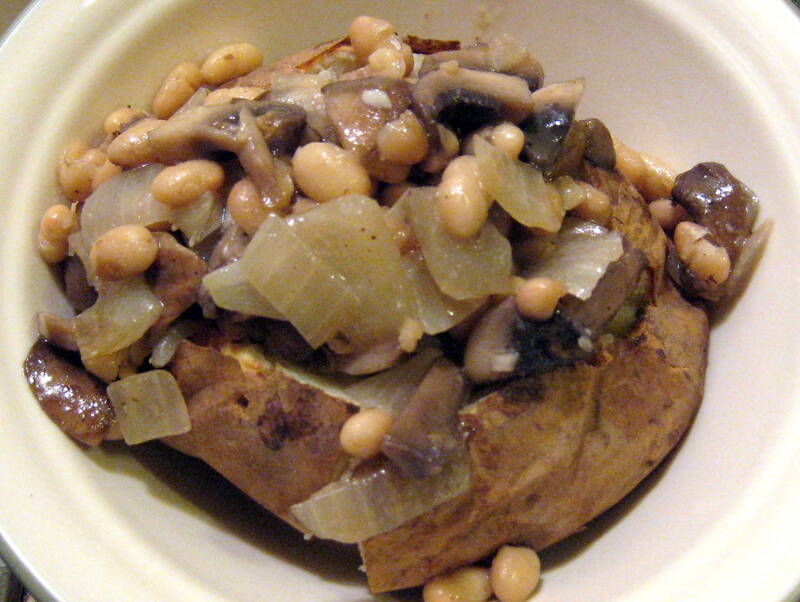 Toss with mushrooms, jicama, ginger, and red onion, and marinate for 30 minutes. 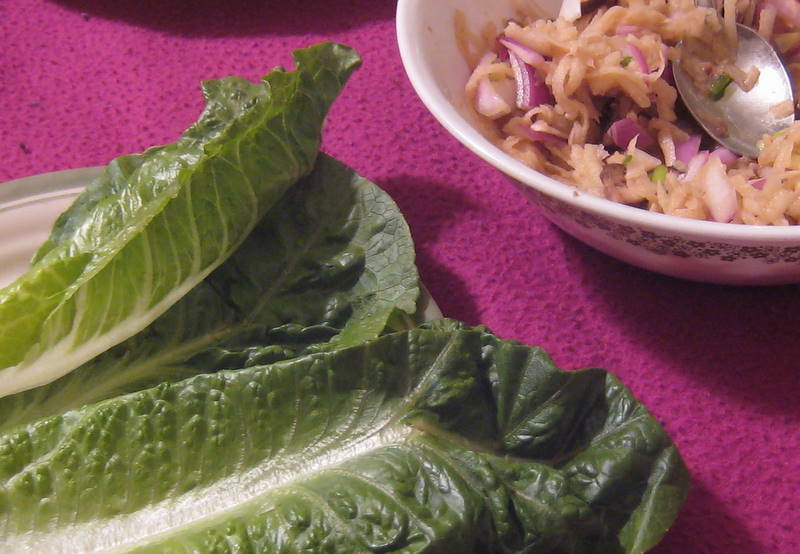 Serve spooned into lettuce leafs. 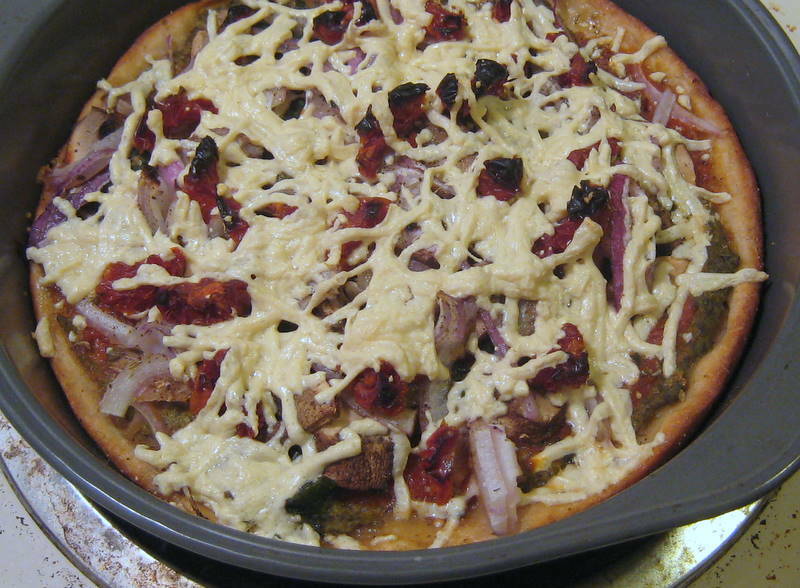 Everything = vegan spinach dip, marinara, spinach, mushrooms, red onions, sundried tomatoes, daiya mozzarella, and a whole wheat crust. 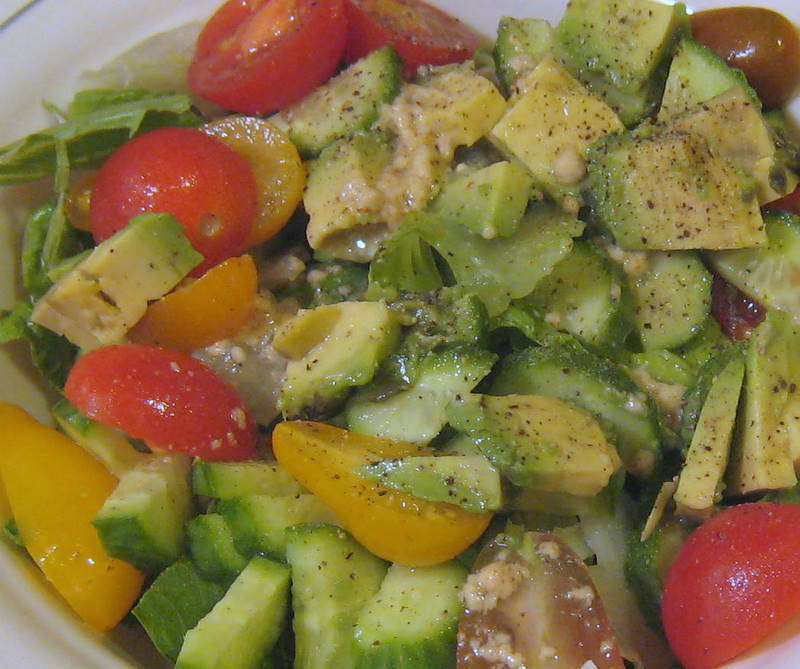 With a fresh, tasty salad! For the pesto: drain and rinse 1 can of white beans, blend together with 1 cup fresh basil, 1/3 cup nutritional yeast, 1 tsp garlic powder, 2 TBL lemon juice. Cook your pasta and saute your veggies. Mix it all together in a big, delicious bowl.